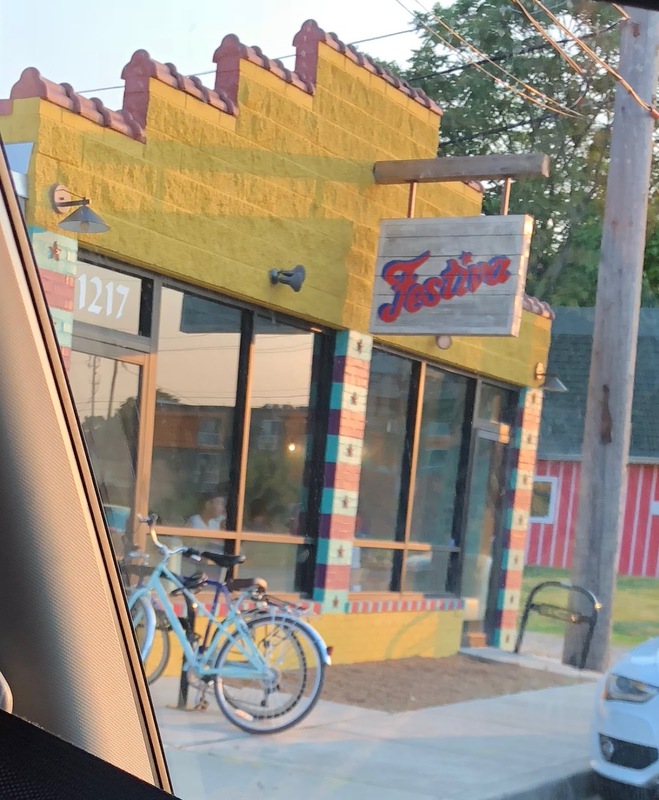 In case you haven’t heard, there are new owners at Festiva—it is the previous owner of La Chinita Poblano in Broad Ripple. We were excited to give the new place a try and see how and what had been changed. The first thing I appreciated is that you can now eat there even if you are under 21, so on one of the visits discussed here, we took the kids. The other visit was with friends. 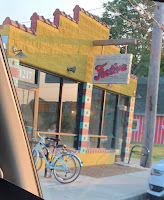 There are certainly some highs and lows at Festiva food-wise. On one visit we had the guacamole ($9) and on one visit the queso ($7). 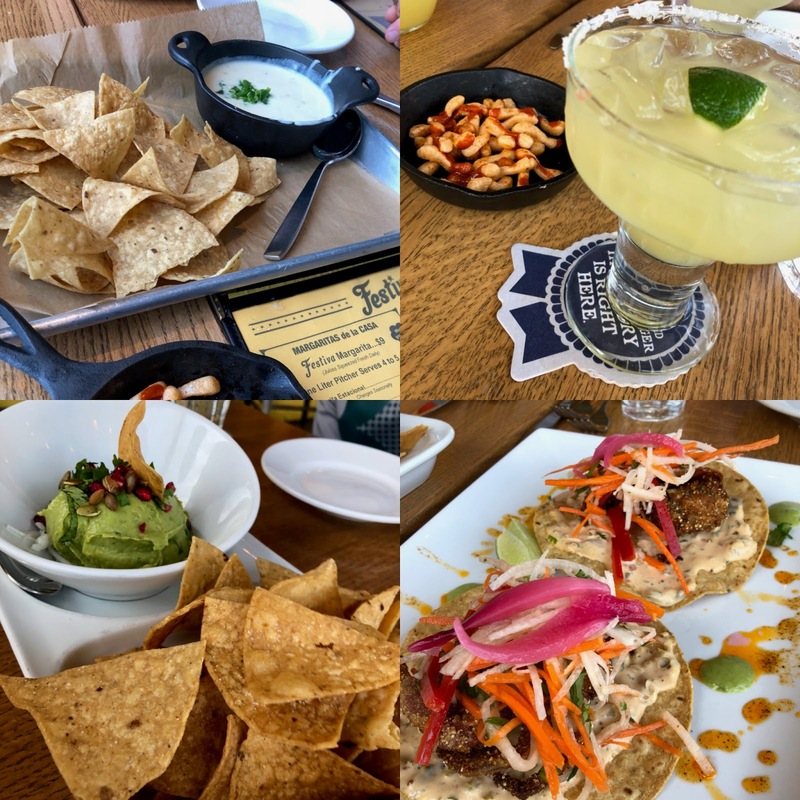 The guacamole is described as the best in town, and it is definitely up there. Seasoned well—lots of salt and lots of acid. Extremely good. The queso on the other hand, which is described on the menu as tres chiles queso is not very good. Not a lot of flavor and very thin in consistency. I feel like queso is something that shouldn’t be too hard to get it tasty and I think this recipe needs to be shaken up. The chips are solid. Other really good things—the margaritas. Both times we had a pitcher of the house margaritas ($30 for 4-5 margaritas). I like that you don’t have to go fancy here to get a quality margarita. Also, I like the little crunchy spicy bits you get when you sit down as well. 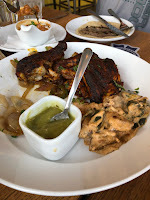 I don’t love the hot sauce drizzled on them, as it quickly makes them go soggy, but the ones without or the ones eaten quickly are very tasty. So one of the visits they had a special that was SOFT SHELL CRAB tostadas. Well you know I was ordering these (it was the masa antojito of the day). These were outstanding. Half a crab on each (would have preferred a whole, but you know), a spicy crema type sauce underneath and lots of delicious pickled veggies on top. This dish was a star and I almost ordered a second round and I wished I had instead of what I did order. It was a special, but if they ever have them when you are there, get them. The other thing that I ordered the same visit as a main dish, even though it’s actually listed as an appetizer is the shrimp cocktail ($11). Now I have had Mexican shrimp cocktails in California before and they were amazing—they are almost more like a cross between a ceviche and a bloody Mary. Sadly, this one didn’t have much flavor to it and was lacking the avocado that was described on the menu, which made me sad. There was none. There was a lot of cucumber, which is not my favorite. This was a pass. A big winner on both visits was the carne asada ($20). This is a good size piece of marinated skirt steak—it’s marinated in a cilantro-based sauce. It comes with sautéed onions and peppers and choice of sides. 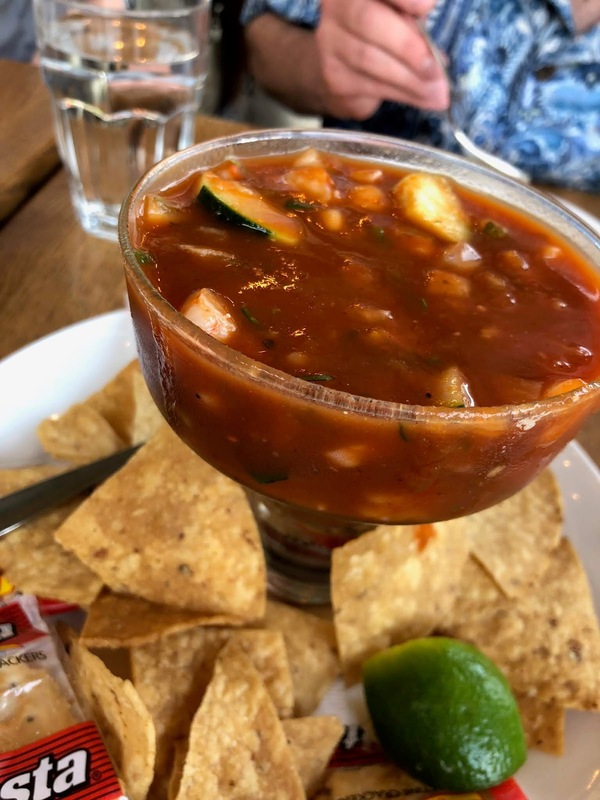 We’ve tried several, but the most commonly ordered seem to be the potatoes (rajas con papas) and the beans (frijoles charres). 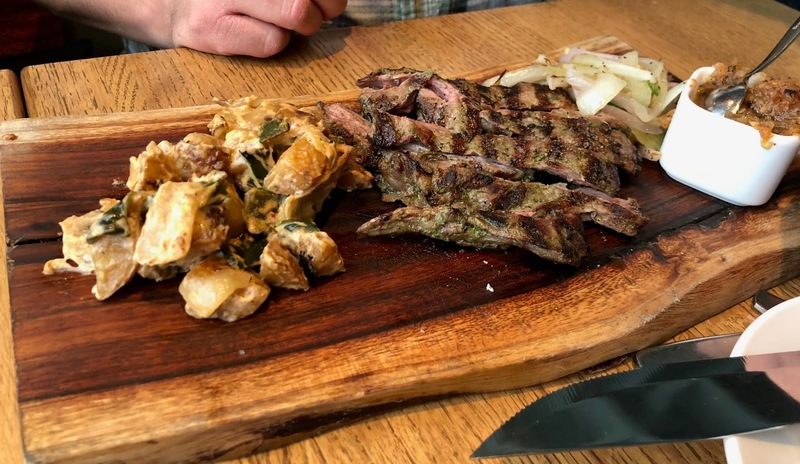 This steak has so much flavor from the marinade as well as the salsa-type sauce that comes with it. This was a table favorite on both visits with both groups. 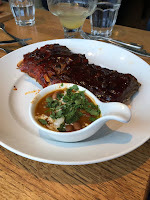 On one visit we also had the costillas ($18 for half rack), which are honey/guajilli braised pork ribs. The menu says it comes with a crema, but I didn’t see any. The ribs were quite good though—extremely tender and with a nice smoky flavor. On one visit we ordered the pollo in achiote ($16) as well. This is a half-roasted chicken in an achiote rub (it has a red color and an earthy flavor). You know, I think our chicken was a bit burnt, although it had a decent flavor. Part of the color is certainly from the spice rub, but we saw several others come out that were not so dark. The chicken was a bit dry once you got into the white meat as well. I think if this was executed just right, it would be very tasty. 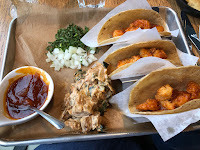 The least successful dish for me on one of the visits was the shrimp tacos ($16). They are described as salt and pepper crispy shrimp (I love a good salt and pepper preparation), with caramelized onion, chipotle salsa, cilantro and onion. For whatever reason, these came across as really flat to me. The shrimp were good quality, but the flavors just didn’t have the acidic balance I crave with this kind of food. On both occasions we had the churros ($5) and on one visit the dark chocolate flan ($7). The churros are good---one the second trip, I think they were cooked just a little beyond ideal, but in general you can’t go wrong with stick-shaped doughnuts covered in sugar, drizzled with caramel, and served with dark chocolate dipping sauce. The dark chocolate flan was interesting. I am not usually a fan of flan because it is often kind of boring and one dimensional, but the slight bitterness of the dark chocolate took it to a more interesting place. Overall, I think Festiva is a fun place to go, and I like the setting, the service, and the drinks for sure. I have found several really good food items as well, even if I hope they keep tweaking some of the menu items as they grow. It’s certainly a place we will return (my kids are already asking), and since we can bring them now, this makes it more of a doable option. Those of you who have been since the ownership change, what do you think? I haven't had a decent queso in Indy in a long time. They have all been super thin and runny.